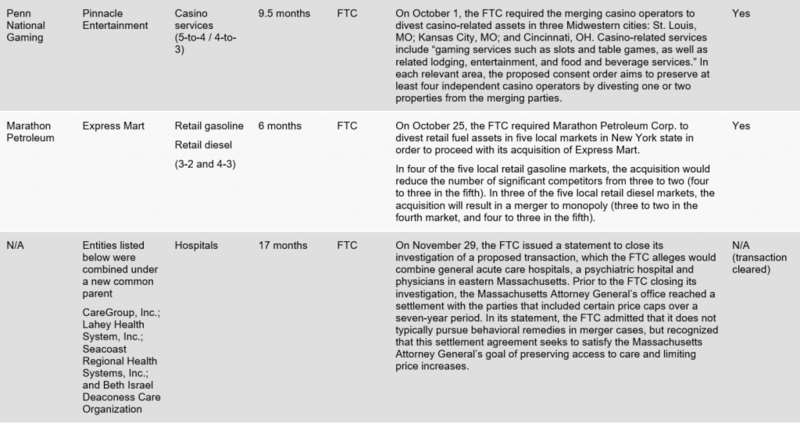 Both the Department of Justice (DOJ) and the Federal Trade Commission (FTC) were very active in the final quarter of 2018, closing seven cases that required in-depth investigations. 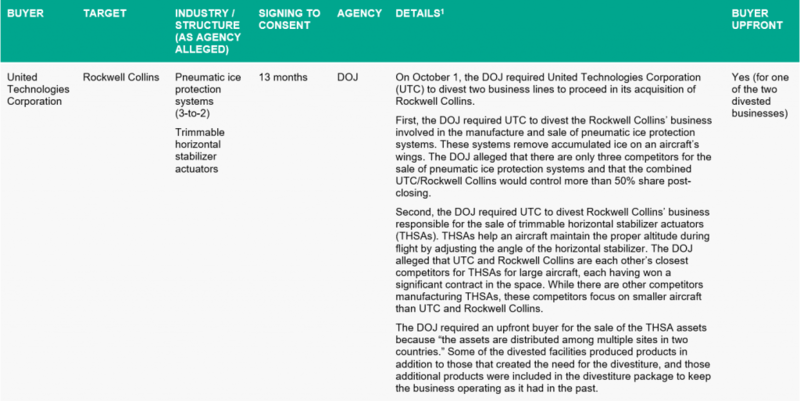 In the UTC/Rockwell Collins merger, UTC agreed with the DOJ to divest two of Rockwell Collins’ Aerospace businesses worldwide to preserve global competition in the supply of aircraft components critical to safety. The DOJ also issued a new Model Timing Agreement, which is aimed at reducing the burden of second request compliance while providing DOJ with adequate time to review the materials produced and prepare to block deals in court if needed. Having a model agreement likely will lead to more uniform processes in merger review proceedings. Meanwhile, the FTC continued its public hearings on the state and future of antitrust policy in the United States, with a focus on the potential need for updates in the methodology of reviewing high tech transactions. The FTC indicated that one area of focus is whether some high tech deals may be anticompetitive because it could allow a dominant firm to expand its strength into the new market even if there are no horizontal or vertical issues. In the last quarter of 2018, the European Commission (EC) closed 10 merger control proceedings where remedies were required, including acquisitions by global players such as Mars, Takeda and Daimler/BMW. The recent acquisition of the innovative biopharmaceutical company Shire by Takeda and the creation of a joint venture (JV) between Daimler and BMW relating to their car sharing services demonstrates that the EC continues to focus on how transactions can reduce competition in innovation markets. 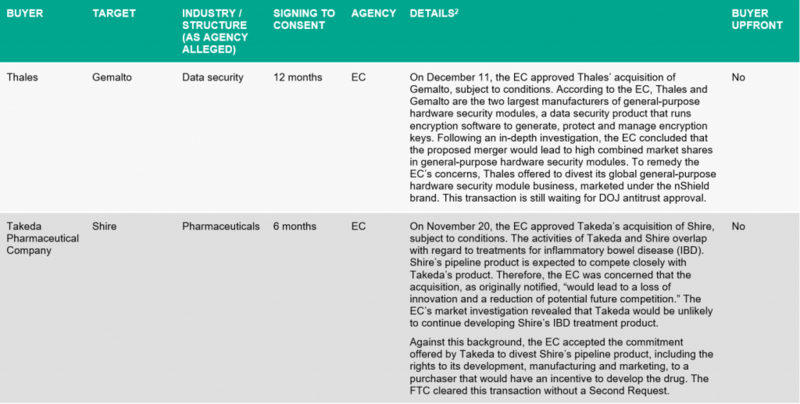 The EC required Takeda to divest Shire’s pipeline product to a purchaser that would have an incentive to develop the biologic treatment product. The EC required Daimler to provide third party car sharing providers with access to Daimler’s integrator app. In addition, the EC also required that third party integrator app providers be able to redirect car sharing users to Daimler’s and BMW’s car sharing services, thus allowing new and innovative service providers to access the recently emerged market for free-floating car sharing services. On November 15, the DOJ released a new Model Timing Agreement in order to “help merging businesses and their counsel know what to expect as part of the merger review process.” Timing Agreements are agreements between agency staff and the merging parties that outline timing for specific events in the agency review process after the issuance of a Second Request. The newly published Model limits the number of custodians and depositions for each party, in exchange for the parties’ earlier production of data and documents. After winning control of the lower chamber in the Midterm elections, Democrats may pursue new progressive antitrust priorities. Legislation previously introduced by Democrats would have required the agencies’ merger review process to analyze a transaction’s impact on wages and employment. Rep. Jerry Nadler (D-NY), the new House Judiciary Chairman, previously sponsored a bill titled the Restoring and Improving Merger Enforcement Act, which would preclude merging companies from justifying mergers through what Nadler described as “spurious efficiencies,” such as laying off workers. While it is unlikely this type of legislation moves forward in the Republican-controlled Senate, Democrats will now have a platform to inject these issues into the public debate. On October 3, FTC Chairman Joseph J. Simons and DOJ Antitrust Division Chief Makan Delrahim testified at an antitrust enforcement oversight hearing held by the Senate Judiciary Committee’s Subcommittee on Antitrust, Competition Policy and Consumer Rights. The agency heads discussed a few of their priorities heading into the new year. Simons testified that “Big Tech Platforms” with significant market power are a “priority” for the FTC. Both Simons and Delrahim testified that labor-related issues arise in merger investigations. Simons explained that FTC staff look into any merger’s potential effect on the labor market, while Delrahim indicated that DOJ staff use the merger review process to search for evidence of illegal “no poach” agreements. At the FTC’s Hearings on Competition and Consumer Protection on December 6, FTC Commissioner Rohit Chopra discussed the “explosion of corporate debt” and its effect on the merger review process. 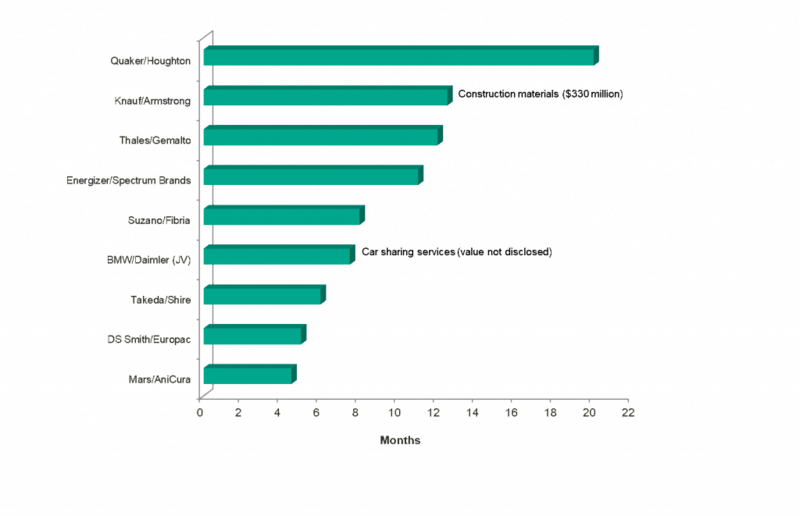 Chopra expressed significant concern about divestiture buyers with heavy debt loads that could limit the buyer’s ability to compete effectively. Chopra criticized the FTC’s past failures at securing safeguards in the language of consent decrees addressing risks associated with buyers with significant debt. Chopra compared the FTC’s position to that of sophisticated lenders, suggesting that “[i]f Wall Street creditors can protect themselves from getting burned in these situations, enforcers should consider using similar provisions to protect the public.” Chopra’s remarks suggest that at least some of the commissioners will become increasingly skeptical of highly leveraged divestiture buyers. On December 4, Commissioner Margrethe Vestager delivered a speech on “protecting consumers in a digital world” highlighting the EC’s analysis in prior merger cases where the merger may give a company access to data that would impact competition. Commissioner Vestager indicated that the EC would continue to make sure that powerful digital businesses do not misuse their control of data needed to compete in a given market and hold back innovation. The EC has hired three experts to advise Vestager on how a digital economy will affect markets and competition. These experts are expected to produce a report by the end of March. The German federal government has agreed on stricter rules for the acquisition of shares in German undertakings by foreign non-EU investors. Therefore, it decided to amend the German Foreign Trade and Payments Regulation. The tightening of the rules on foreign investments is a reaction to the recent large increase of takeovers of German companies by foreign—in particular, Chinese—investors. The information in this column summarizes the government’s allegations. McDermott Will & Emery LLP offers no independent view on these allegations. Noah Feldman* Greene focuses his practice on antitrust matters. During law school, Noah served as a judicial intern for the Hon. Beverly Reid O’Connell of the US District Court for the Central District of California. He was senior editor of the Virginia Journal of International Law and participated in the William Minor Lile Moot Court. *Not admitted to practice in the District of Columbia; admitted only in California. Supervised by principals of the Firm who are members of the District of Columbia Bar. Carina Kant is an associate in the law firm of McDermott Will & Emery Rechtsanwälte Steuerberater LLP, based in the Firm's Düsseldorf office. Her practice covers antitrust and competition law. Carina studied law at the University of Trier, specialising in European and International Law. During her studies, she has obtained an additional degree (FFA) in French and Japanese law. After her First State Exam, she graduated from the Université de Lausanne, Switzerland with a Master of Laws (LL.M.) in International and European Commercial Law. During her legal clerkship, Carina worked for renowned international law firms in Luxemburg and Hamburg.